Sipping coffee in a room full of cats is no longer reserved just for the eccentric shut-ins of New York City. The city's first cat cafe (and the nation's second), Meow Parlour, will open its doors on December 15th at 46 Hester St. It's the brainchild of Christina Ha and Emilie Legrand, the folks behind the Macaron Parlour bakeries, and will feature a feline-filled room next to a cafe doling out the same drinks and eats found at their bakeries. 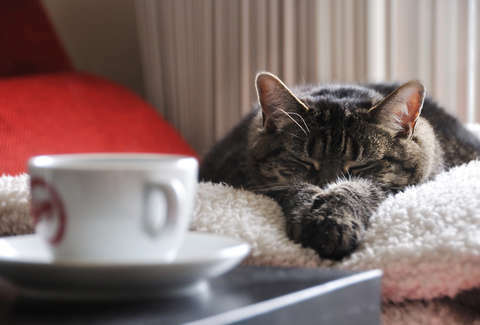 Once the cafe opens its doors, you'll be able to pay four bucks for every half hour in the Wi-Fi-enabled cat room (which is separate from the food room), with a max of five hours. Five hours! And since demand will probably be pretty high, you can make a reservation online to ensure you get to savor every precious second with the adoptable furry friends, which all come from the KittyKind rescue center. And should you want to throw the strangest/fluffiest birthday party ever, the space will be available to rent out for private events. If you can't contain your excitement until December, check out the cafe's website for more info and plenty of adorable pics. Pete Dombrosky is an Editorial Assistant at Thrillist and you should thank him for not using any cat-related puns in this article. Do so on Twitter.